Glass Hardware for 8 mm to 12 Glass Doors. 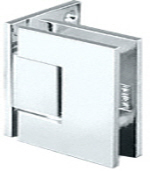 Glass Hardware for glass-Doors Wall Mount Offset Back Plate Hinge. Glass Thickness: 3/8 to 1/2 inch (8 to 12 mm Glass) Construction: Solid Brass. Glass Hardware for glass-Doors Wall Mount Offset Back Plate Hinge. Glass Thickness: 3/8 to 1/2 inch (8 to 12 mm Glass) Construction: Solid Brass Hinge Swings: 90º in and 90º out, Closing Type: Self-Centering when within 15º of closed position, Cut-Out Required. Includes: One Hinge, Gaskets, Screws and Template.